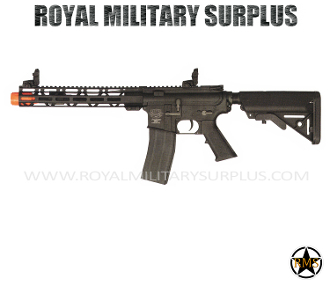 The Valken Tactical Alloy Series Mk.II is our SBR variant in our new premiere line of full metal AEG rifles. The durable high quality aluminum alloy bodies are milled to finish and hard coated to create a tough exterior, combined with a mills spec CNC'd free floating M-LOK rail system, and a 1 piece metal lightweight outer barrel. Inside is a Ver. 2.1 Gearbox, with a micro switch trigger system designed and tested with 11.1v LiPo's that presents a solid trigger break and reset for fast response. The gearbox also features a low resistance steel wire harness that clearly indicates positive from negative. The inner barrel assembly is a 70D full seal bucking, polymer hop up unit with precise adjustment, and carbon steel barrel the MK.II' is sure to turn heads as you send plastic down the field.